There is a saying that says, ‘Never let the facts get in the way of a good story.’ I am pro the use of this phrase. 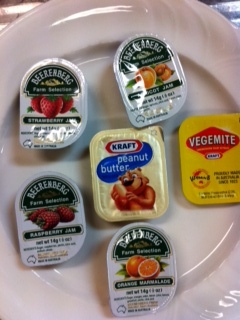 However, it has been pointed out to me that the hotel my cousin works at supplies more than just strawberry jam. He has even supplied photo proof. As I am a fan of raspberry jam (the Dr Seuss in me coming out again) I will stay at his hotel in the future. You too may like to favourably consider his workplace, and their associated hotels, should you be planning a holiday and like variety in your breakfast conserves. Perhaps I will also encourage Trip Advisor to add a ‘Jam Selection’ tile, along with the current, Price, Property, Location and Hotel Class. I think it will make all the difference to travellers selections. After all, they say it’s the small things that make all the difference. That’s enough light relief for now…get back to work.